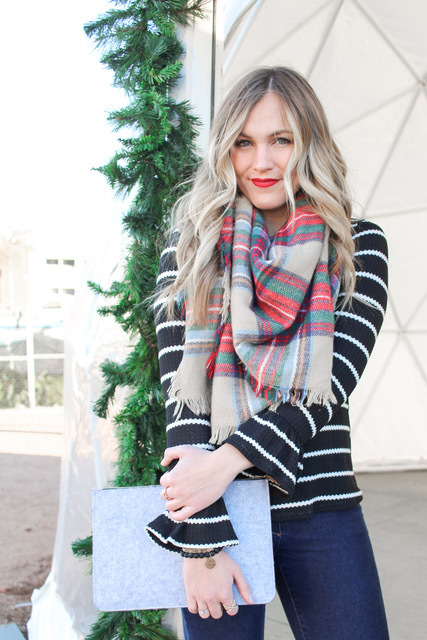 Bell Sleeve Stripe Top (so flattering!) | Blanket Scarf | Similar Clutch Here & Here | Beaded Bracelet | Hunter Boots | Lips, color is "Fiery"
I typically spend 345 days out of the year looking forward to and anticipating Christmas. You know, that feeling of joy and happiness and magic that fills you up inside? But it seems that with every passing year as I get older and life gets busier and busier, I find it more difficult to get in the Christmas spirit. Instead, I'm worried about checking off my to-do list, getting to work on time and not sneaking too many holiday treats. This year especially, since I am recovering from shoulder surgery, I've been saying "Bah Hum Bug" more than ever before and ya'll.....that's just not OK! Cue Faith Hill, "Where Are You, Christmas?" I've challenged myself this weekend to get in the Christmas spirit, one way or another! 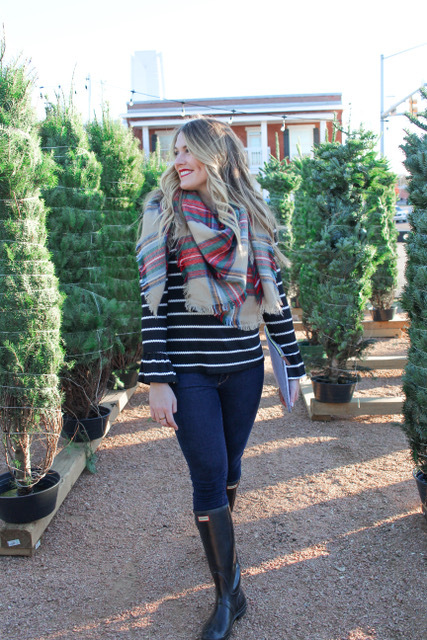 I put together a list of 15 things to help bring out the holly jolly hiding inside. How do you get in a festive mood? 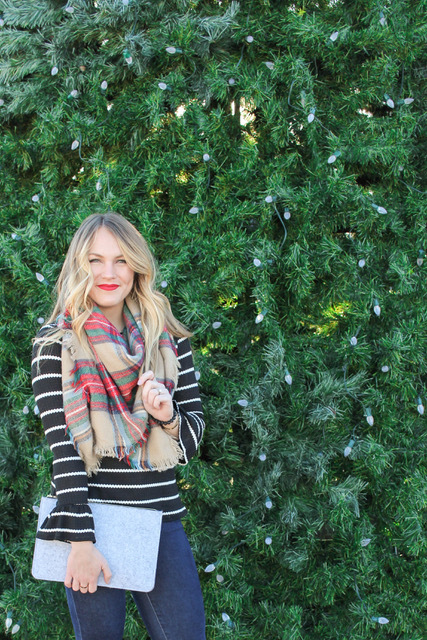 Wear Christmas PJs - there's a roundup coming to the blog next week! Wear All the Red! Nails, Lips, Scarves, Beanies, Sweaters... Everything! Burn Christmas Candles - THIS is my favorite! Bake Christmas Cookies - bonus points if its a secret family recipe! Send Christmas Cards - see where I got mine! 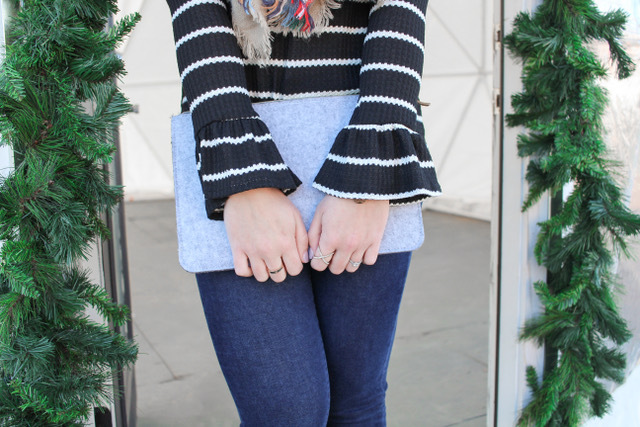 I want to give a shoutout to ModCloth for this striped bell sleeve tee! 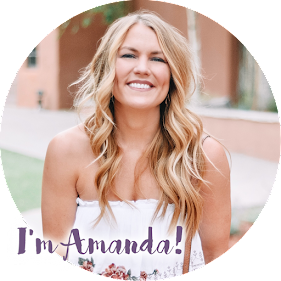 It is so simple yet the bell sleeves make it different than any other tees out there right now. The cut is feminine and flattering - I want to wear it on repeat! 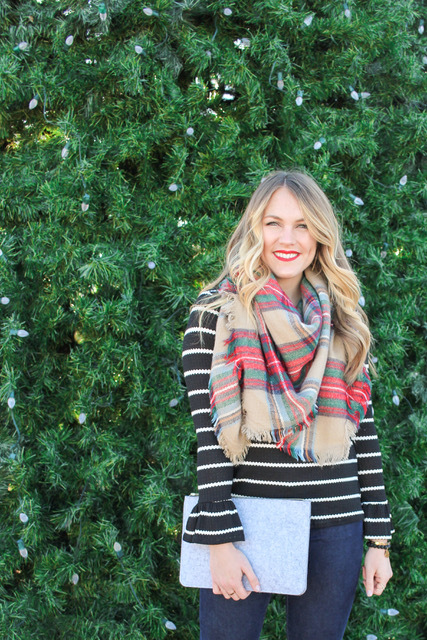 My basic blanket scarf and my FAV red lipstick gave me a little holiday cheer. What are you up to this weekend? I literally have zero plans besides laying on the couch and bingeing Pretty Little Liars / The Hallmark Chanel and I'm 100% OK with that. Having a major surgery makes being a couch potato acceptable, right?? If I feel up to it, I might be able to convince C to check out Holey Rollers' new donut shop in the Paseo District.....comment if you think he should take me on a donut date!! 😉 I'd also love to hear how you get in the Christmas spirit.